The revised plan for the Ravines at Hoover. 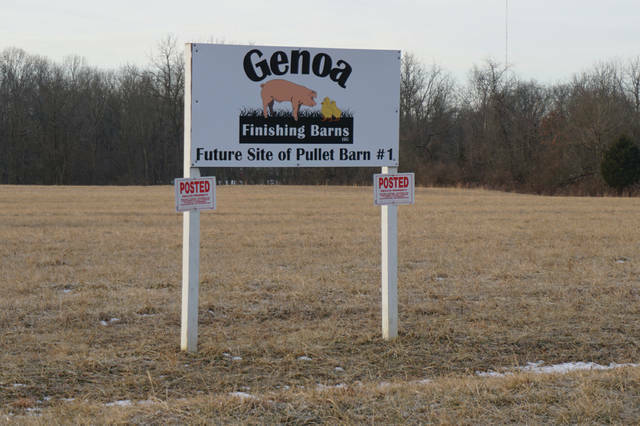 Signs for Genoa Finishing Barns sit on the property for the proposed Ravines at Hoover. 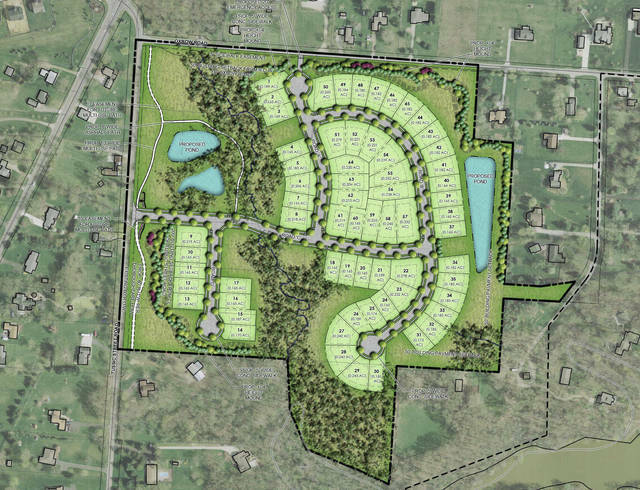 The Genoa Township Zoning Commission unanimously rejected a preliminary development plan for the Ravines at Hoover at its meeting on March 12. The commission also denied rezoning the nearly 43 acres at 4741 Tussic Street from Rural Residential (RR) to Planned Residential Development (PRD). Since meeting with the commission on Feb. 12, the applicant had reduced the number of single-family homes (with a minimum size of 1,700 square feet) from 67 to 64, with asking prices in the $600,000 range. Other revisions included a new entrance at Tussic instead of Oxbow Road, and more open space. It was also promised that local builder Vince Romanelli was in contract to build the development near a quiet upper portion of the Hoover Reservoir. The March meeting was a continuation of a meeting on Jan. 8 in which there was public comment. There was no public comment at the February meeting, but residents were given a chance to speak out once again. Most were opposed to the Ravines at Hoover. Other concerns included traffic, fencing off the development’s retention ponds from children, wetland mitigation and conservation. “Our job is not to stop growth, but to manage it,” said zoning commission member Jill Rudler. Commission members said the Ravines at Hoover failed to “preserve and extend the charm and beauty existent in and inherent to the rural residential character of Genoa” and other township policies. The Genoa Township Trustees met on March 15 and set the next hearing for the property to Monday, April 9th at 6:30 p.m. in the Township Hall, Zoning Director Joe Shafer said in an email.